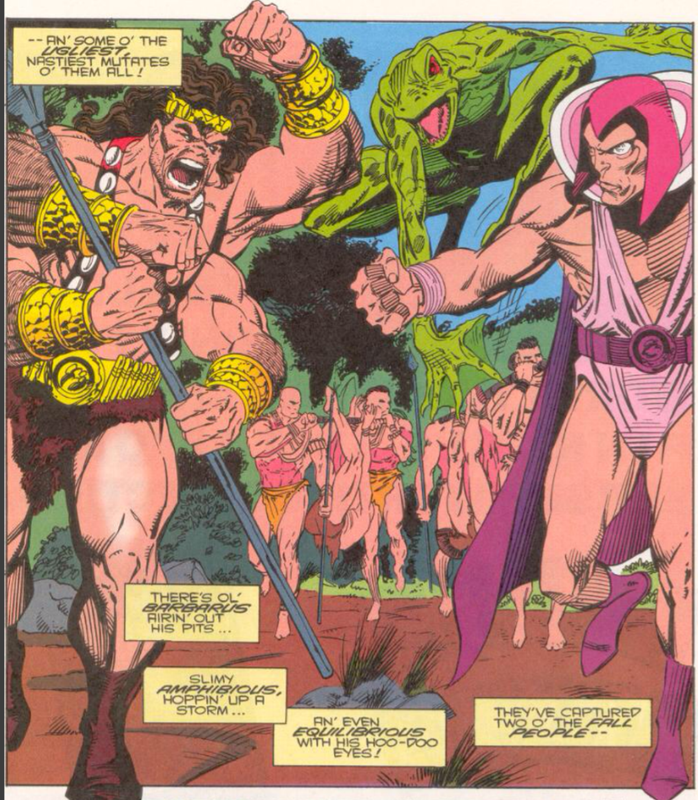 "Induction in the Savage Land!" Wolverine, Rogue & Jubilee are sent on a scouting mission to the Savage Land. 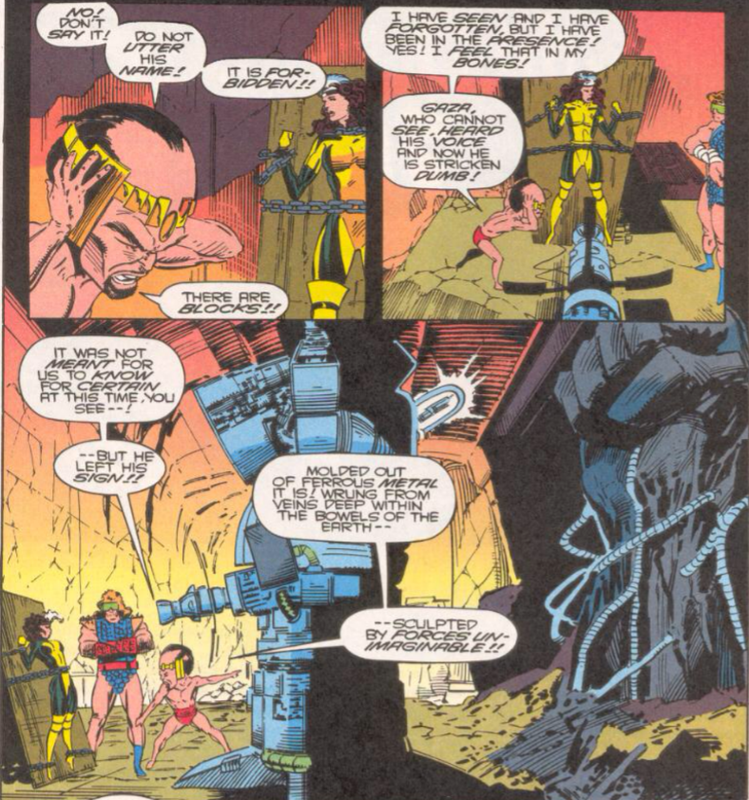 Wolverine, Rogue & Jubilee arrive in the Savage Land, having been sent on a scouting mission by Professor X. After fighting off a dinosaur, they set up camp, and Rogue takes to the air to scan for magnetic anomalies while Wolverine sniffs things out on the ground. He encounters a pair of Fall People captured by a group of Mutates. 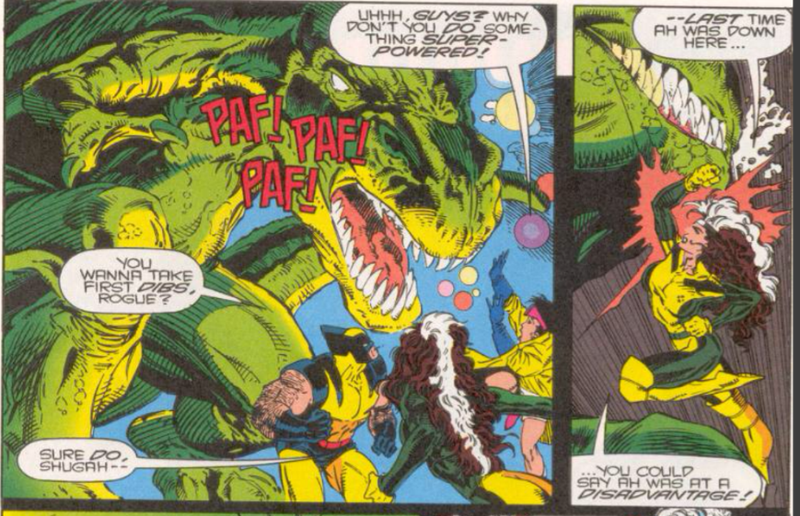 Meanwhile, Rogue discovers a ranting Brainchild inside one of the Savage Land's ancient citadels, and Jubilee is captured by a Pterosaur Rider. 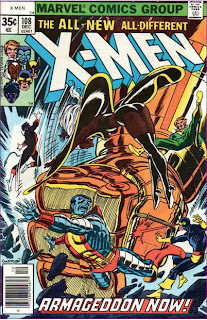 Wolverine follows the Mutates to some kind of temple, where he intervenes to prevent the sacrifice of the captive Fall People, while Rogue realizes Brainchild has seemingly encountered Magneto recently. Back at the temple, Wolverine fights his way through the Mutates and their barbarian allies only to come face-to-face with their leader: Sauron. This issue features Wolverine, Rogue and Jubilee investigating the Savage Land for signs of Magneto (since he has a history with the place), really the first time the series has taken inspiration for a story from a plotline unfolding in one of the other X-books. Of course, the X-office doesn't want to come right out and say that Magneto is alive (yet), so everyone in this issue spends a lot of time speaking in euphemisms, being cut-off, or generally going out of their way to avoid saying "Magneto" to an at-times laughable degree. That said, it's pretty clear who made the giant iron fist. Because you can't go to the Savage Land without encountering them, this issue features of handful of the Savage Land Mutates (the mutants created by Magneto way back in the Thomas/Adams X-Men run), including Braindchild, Gaza, Barbarous, Amphibious, and Equilibrious. They are being led by Sauron, as the last page reveals, who is back in the Savage Land following his stint with Toad's new Brotherhood of Evil Mutants. Rogue notes her eyes are still sensitive; this is the first time we've seen her not wearing protective glasses since "X-Cutioner's Song". Dwayne Turner draws this issue, and will draw the next four (with Jim Fern on #74) before Adam Kubert joins the series as the new regular penciler with issue #75. This is the first issue of this series I bought back in the day, and I remained a monthly buyer from this point forward through to its cancellation (and then into its subsequent relaunch, though I didn't last through that past its subsequent relaunch). When I first started buying comics, as much as I was into the X-Men (and Wolverine, generally), his solo series also seemed detached from the main books - I didn't buy it initially, and never felt like I was missing much as a result. Plus, it was always a couple quarters more than the other X-books (these reasons also apply to why I wasn't a regular reader of Excalibur initially as well). But somewhere along the way (probably from Wizard), I caught wind that this issue would tie-in with the larger "return of Magneto" narrative running through the X-books I was reading, so I picked it up. And it was, indeed, rife with teases that Magneto was alive. That, combined with knowing that issue #75 would be part of the "Fatal Attractions" event, was enough to keep me buying the intervening issues, until the events of #75 created an "OMG I have to know what happens next!" sensation that kept me buying the series until I was just pot committed to buying all the X-books. So basically, I'm saying this issue's laughably-not-vague hints at Magneto's return are responsible for me reading a lot of really crappy Wolverine comics in subsequent years. 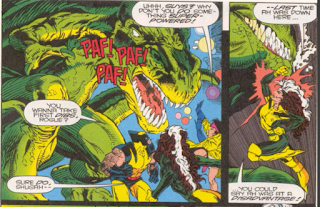 Rogue notes that she was at a disadvantage the last time she was in the Savage Land, a reference to Uncanny X-Men #269 and #274-275, in which she spent most of her time without her powers. Jubilee has an English assignment due, a nice reminder that, unlike the rest of the X-Men at this point, she is still underage and thus technically also an actual student at Xavier's school. Wolverine notes that his mind is finally clear of memory implants following the events of the "Terry Adams" story, though later stories will make it clear it doesn't yet possess access to all his memories. In another indirect reference to Magneto, Rogue spots the outline of his helmet in the dust. 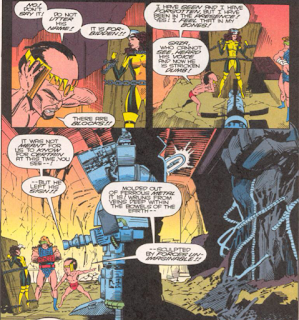 Jubilee refers to a Forge-provided force field as "not-get-throughable". Jubilee's assignment involves reading Charles Dickens' David Copperfield (she wonders when the magic is going to start), and she not-incorrectly dings it for the scope of the coincidences involved in the story. I know it's partially my bias showing, seeing as this issue marks the beginning of my regular Wolverine reading back in the day, but this issue really does feel like Hama is making a concerted effort to tie the series more tightly to the other X-books, for really the first time in its history. 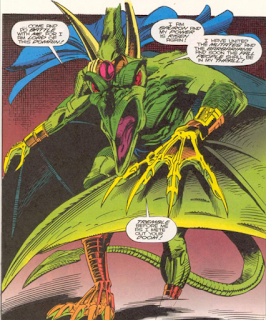 It's not just the inclusion of Rogue - Hama's run already reached out to feature more X-Men guest stars than ever before in the series - or the presence of Sauron and the Savage Land Mutates, X-Men villains without a pre-existing connection to Wolverine - there was, at least, Mystique, Spiral & Mojo in "The Crunch Conundrum". It's the fact that the impetus for the plot is being inspired directly by events in other X-books (chiefly Uncanny X-Men at this point) by having Wolverine investigate the Savage Land for signs of a revived Magneto. For most of its previous existence, this title existed on the margins of the larger X-narrative: it showed what Wolverine was up to during his various absences in the Outback Era, and later, picked up some threads from the Omega Red story in X-Men to do a deep dive into Wolverine's past. But if you were an X-Men fan but not a particular Wolverine fan, you could safely skip this series without feeling like you were missing part of a larger story. That changes with this issue. Granted, searching for traces of Magneto in the Savage Land is hardly must-read material in terms of the larger Magneto story (spoiler alert: Wolverine won't encounter him here), but the "return of Magneto" is (along with the Legacy Virus) the big cross-title subplot winding its way through the core books at this point in time. By bringing it to Wolverine as well, Hama (and/or Bob Harras and the larger X-office) finally bring Wolverine into the narrative fold of the X-books at large. Wolverine gains a solo series compatriot with Cable #1. 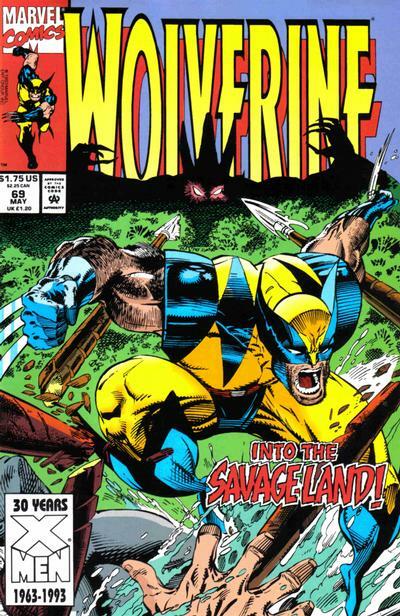 I've noted before that I didn't read WOLVERINE when I was younger, aside from crossover issues, and this is no exception -- but I had a friend who owned these Savage Land issues and I read them at his house. I really liked Dwayne Turner's artwork here, and I loved the tie-in with the impending return of Magneto in UNCANNY. As I mentioned when I looked at the FATAL ATTRACTIONS hardcover on my own blog last year, it's really a shame this three-parter didn't make it into that collection. The first time this series felt tied in to larger doings, to me, was when Hama brought in The Reavers, who got such a big build-up in Uncanny only to kind of fall by the wayside after Uncanny 269. Hama was the only one who used the new Reaver, Cylla, after Claremont made such a large point of introducing her. But yeah, this definitely seems like a change. Oddly enough, for me, seeing this issue on the stands, only cemented my decision to drop the series after #65, because I was at a point where something that was disengaged from the larger X-narrative would have had more appeal to me, rather than less. I'm fairly certain that the red-black costumed blonde woman with something akin to skull-face who saved Lady Deathstrike from Fitzroy's Sentinels in UXM #281 was supposed to be Cylla (Pierce's new Skullbuster), but no one told Hama. Yet another version was (possibly) the green-themed skull woman in the "Things to come" poster thingy. And it can be argued that WOLVERINE was tied to the larger X-Men world from practically the very beginning of Hama (and Silvestri) run in #31. After the brief introduction, the Reavers appear, and then a bunch of X-Men become effectively a permanent supporting cast for WOLVERINE; Sabretooth is found in sewers after the NEW MUTANTS fight with Caliban; "Dreams of Gore" and following stuff ties closely to the stuff related to Omega Red in X-MEN #4-7. Manchu in Shang-Chi when Marvel no longer had rights to the character, or a character still under trademark obtusely referenced in League of Extraordinary Gentlemen, or Batman in those DC Universe trading-card sets when he was under license individually elsewhere. 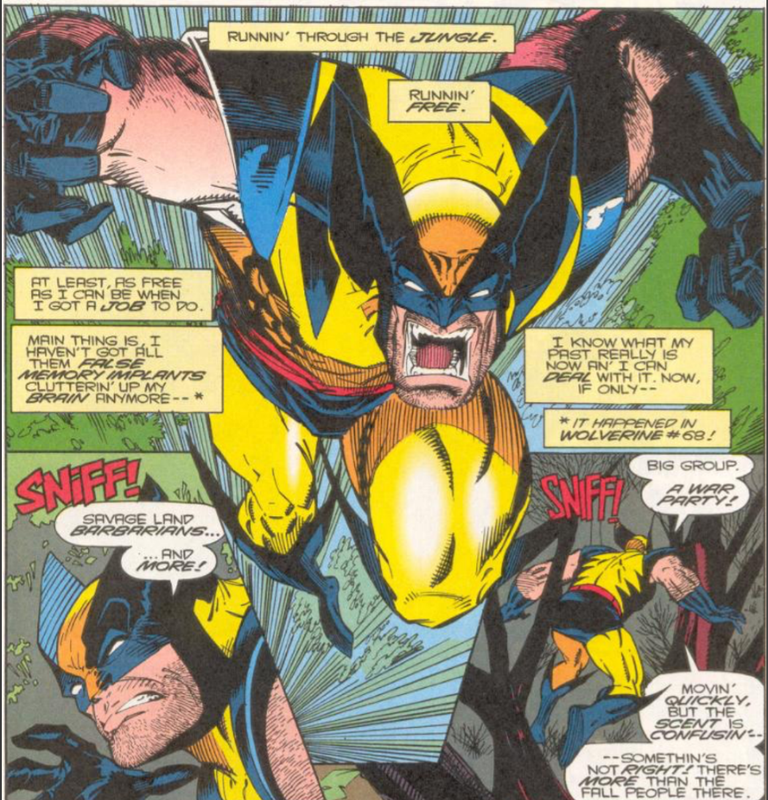 I totally get why you didn’t pick up Wolverine at the time from the perspective of the kid you were, but on the whole I’d say that looking back over the run I’ve overwhelmingly preferred the stuff that was decidedly out of the X-Men orbit — early Claremont/Buscema et al. in particular but also the material that followed in that general vein even when the execution didn’t live up to the concept. Of course I also totally get why Marvel would be more interested in a Wolverine series like this and I’m still amazed that the title launched with Logan out of his familiar costume under a different alias at a time when the X-Men, Wolverine included, were supposed to be dead. Side note: Madripoor and Logan’s ties to it were a major continuity implant but he was still far enough from overexposure that the new setting, on its own and in being close enough to his sometime stomping grounds of Japan, made narrative sense. Wolverine’s past hadn’t been explored much; even the length and breadth of it remained in question. Now we’ve come out the other side of a preoccupation with Experiment/Weapon/Team X stuff to a greater integration with the X-Men line and Madripoor’s been unmentioned for so long that it’s hard to write it off as a part of his life we just don’t see the way a reader could when it was introduced. Jubilee’s listening to U2’s version of “Helter Skelter” off of Rattle and Hum, which… doesn’t seem on-brand. Ranting Brainchild is my new band name.